Today's readings are on being sent out by God. In the first reading, we read of Amos who was simply a shepherd and dresser of sycamores or he prepared the fruit by puncturing it before the harvest so it can assist in the ripening process. Amos tells the priest of Bethel, Amaziah that he was not prophet and was never around them, yet the Lord took him from being a follower to going out and prophesying to the people of Israel (2 Chronicles 24:19). He would earn his bread via this work (1 Corinthians 9:6-7,14). God's actions here are nothing knew. We read last Sunday how God uses the weak (see: http://www.sacerdotus.com/2015/07/14th-sunday-in-ordinary-time.html). By using the weak, a louder statement is made upon the world, so to speak. Would an educated and wealthy King speaking on behalf of God gather your attention more or would a young child who is disabled, yet speaks better than the educated do the trick? The latter would since it is not expected that a young child who is disabled can do this. This is why I have always stressed to altar servers I have trained, youth groups I have run, catechism classes I have taught, and other lay people I have worked with that they should not worry as to whether they can evangelize or not. God tends to use the weakest and those who society deems "insignificant" to do His will (1 Corinthians 1:27). Amos was just a shepherd and dresser of sycamores yet God called him to prophesy to the people of Israel. You reading this may be at home disabled, elderly or perhaps young and feel like you cannot find a role in the Church; well, think again. God has a job for you (Jeremiah 29:11). Pray to Him to see what it is (Jeremiah 42:3). Let go and let God, as the saying goes. Pray to God and ask Him to see His kindness as we read in the Psalm for today. In the responsorial Psalm, we ask the Lord to show us His kindness (Psalms 36:7). We sit still in His presence and listen to what God proclaims (Exodus 33:14, Jeremiah 29:13). This proclamation is of peace and calls us to salvation. In God, kindness and truth meet. Justice and peace will kiss. God unites the good and casts away the bad. The truth of God will spring from the earth as His justice looks on down. As followers of God, He will give us His benefits which will bless our lands bringing forth an increase. In God, we will have justice because justice prepares His way. All things submit to God. It is God who blesses us and bestows on us what we need as we read in the second reading. The second reading tells us of how we are blessed in Christ. The word "blessed" comes from the old words "bledsian" or "blotham" which is spelled "blood" today in modern English. It is connected to the pouring and use of blood during rites of expiation in Pagan Proto-Germanic lands. We are truly "blessed in Christ" who shed His blood for us on the Cross (John 3:16). God chose us before the world began to be His, holy and without blemish (Jeremiah 1:5). God in His love adopted us through His Son Jesus; we can call Him "Abba, "Papa," or "Daddy" (Mark 14:36, Romans 8:15, Galatians 4:6). In His blood, we are redeemed (Ephesians 1:7). It is in this Christ in whom we will find the sum of all things and the fulfillment of life (Matthew 5:17, John 14:6). There is no one else we can find this in, Christ is the One (Acts 4:12). God also chooses us through Christ and sends us to live and proclaim the Gospel of salvation as we read in the Gospel reading. In the Gospel, Jesus summons the Twelve and sends them out two by two. He gives them authority over demons and tells them to go only with a stick, no food, no sack or money; just simply with sandals and a tunic (Exodus 12:11; Deuteronomy 8:2-4). St. Francis of Assisi centuries later would adopt the same thing. Unfortunately, the Order of Friars minor today have lost this beautiful imitation of Jesus' command. We must pray for their renewal. St. Francis understood Christ. It is no wonder why our current Pope chose his name. Christ commands the Twelve to visit homes. 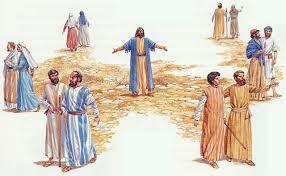 Whoever does not welcome them, Christ instructs His disciples to leave and shake their dust off their feet. This would be a testimony against them showing that the home dwellers chose to adhere to the dirt of sin and did not want to be cleansed via God's grace (Nahum 3:6, James 1:21, Isaiah 57:20). The Twelve did as He instructed and drove out demons, anointed with oil the sick and healed them in His name. We today are also called to go out and evangelize. I remember my days in the "Boogie down Bronx" where I and an old Puerto Rican parishioner would go out to evangelize in different neighborhoods, some which are plagued with poverty and crime. We did this as Legionaries in the Legion of Mary. We visited homes and were welcomed in many of them. I got great joy seeing many of these people at Mass weeks later. Some who were not Catholic became Catholic. It was a great experience for me just about a year or so from leaving behind atheism. This was when Christianity as a "Church" was coming alive to me. I was still finishing some my worldly studies. Despite being unprepared fully, God guided me and my fellow legionary. He was older, and I was younger, but God did the work for us. Not once did we worry about being mugged, verbally insulted or even killed. We went in God's name, guided by the Holy Spirit and encouraged by the Blessed Virgin Mary. Now, God has me doing this work of evangelization online as well. Like in the first reading, it is God who calls us to work in the vineyard (Matthew 20:1-16). We must not turn Him down out of fear or anxiety (Isaiah 6:8, 1 Samuel 3:4). God will be there and will guide us (Isaiah 58:11, Psalm 32:8). No one can do anything to us because we are with God (Romans 8:31). However, times are a-changing. Christians are being persecuted even in America in 2015, the supposed "land of the free." We can expect to face harassment, attacked, sued and maybe even martyred (Matthew 24:9. 2 Timothy 3:12). Being a Christian is not always "puppies and kittens." Nevertheless, do not be discouraged to go out there and evangelize (Psalms 96:3). We must spread the Gospel everywhere (Mark 16:15). However, first the Gospel must be preached in our hearts (Psalm 119:11, Deuteronomy 11:18). If we do not internalize the Gospel and the teachings of the Church, we will be useless. Our work in the Church will be focused on the self, instead of God and others because we have a tendency to put ourselves on pedestals when given a job to do and not be charitable to others (1 Corinthians 13:1). When we do go out there to evangelize, if we are rejected, it is okay (Matthew 5:10-12). Say 'thanks be to God' and walk away. As the youth say today, "it's all good." If you encounter trolls on Twitter, Facebook, Google +, Myspace or whatever network you use, do your best, do not loose your cool (Ephesians 4:26-27). If they insist on ignoring you or mock you, offer a prayer to God for them, respond with love and walk away (Matthew 7:6). You did not fail, they did. God will find a way to get them (Romans 5:20). All is not lost (Luke 15:11-32, Matthew 18:12-14). Today we must evangelize more than ever before. Evangelization must begin in ourselves first, then our families. The family is the "domestic Church" (CCC 1655-58). This is why Satan is attacking the family constantly (Hebrews 2:14, Revelation 12:2-4). He fears the family that trusts in God (Joshua 24:15). Let us continue to spread the faith. Do not be afraid to do so! Take me for example as that young guy fresh out of atheism going out evangelizing. Now I am doing it online as well. I started not knowing anything about websites, blogs, podcasts, Google hangouts etc, yet look at how God allowed all this to grow. If God calls you to do something, He wills it. If He wills it, then it will happen (James 4:15)! We are called by the grace of Baptism to be priest, prophet, and king (CCC 897-913). Let us put these roles into practice. God did not give us a cowardly Spirit (2 Timothy 1:7). May Jesus Christ be praised always! Please help to continue evangelizating online by donating to the fundraiser www.gofundme.com/sacerdotus.